Home Geneva - fragile handle with care! Geneva - fragile handle with care! It is almost ten years since the Eelam war ended with the defeat of the Liberation Tigers of Tamil Eelam (LTTE), but opinion continues to be divided on how its final outcome was achieved with Sri Lanka maintaining that it did not systematically engage in war crimes but the Eelamist lobby claiming otherwise and demanding international inquiries. Matters usually come to a head once a year when the sessions of the United Nations Human Rights Council (UNHRC) gets underway in Geneva. For several years the United States was in the forefront of passing resolutions that could be considered hostile to Sri Lanka but the United States has now pulled out of the UNHRC for reasons of its own. During the previous government under the Presidency of Mahinda Rajapaksa, Colombo strenuously contested these resolutions, albeit not always successfully. The present government however has adopted a different stance: it has worked with the sponsors of the resolutions and co-sponsored the resolutions, thereby being able to modify the resolutions so that they are not inimical to Sri Lanka’s interests. If, in preceding years, there was a tussle between the government in Colombo and the Eelamist lobby based mostly in Western capitals, this year there was a difference: the tug-of-war came from within the Sri Lankan government itself. The first indication that the two factions of the government, headed by President Maithripala Sirisena and Prime Minister Ranil Wickremesinghe, were pulling in different directions came with the announcement that President Sirisena was nominating a delegation to Geneva. The delegation thus named comprised of former ministers (and now opposition parliamentarians) Mahinda Samarasinghe and Sarath Amunugama and the newly appointed Governor of the Northern Province, Suren Raghavan. Samarasinghe, one of the few Sri Lanka Freedom Party (SLFP) parliamentarians remaining loyal to President Sirisena, has headed numerous Sri Lankan delegations to Geneva during the Rajapaksa regime. Ironically both Samarasinghe and Amunugama were previously staunch members of the United National Party (UNP) before crossing over to the SLFP. With no input from the Ministry of Foreign Affairs and public pronouncements by President Sirisena to the effect that he will be safeguarding the reputation of the Sri Lankan Armed Forces, the UNHRC sessions in Geneva this year were shaping up to become yet another bone of contention between the UNP and SLFP factions of the government. The verbal sabre rattling had already begun in earnest. Speaking in Parliament, Leader of the House Lakshman Kiriella urged those representing the President “not to make changes” to the proposed UNHRC resolution. “The resolution has praised the Sri Lankan government for resolving the political crisis of October 26, 2018 amicably, setting up and facilitating the function of the Office of Missing Persons (OMP), making arrangements to enact the Reparation Bill and other human rights laws and releasing of lands held by the Armed Forces held in the North and the East. Therefore, it would be advisable not to make any adverse changes,” Kiriella argued. However, Samarasinghe urged more caution in dealing with the UNHRC. 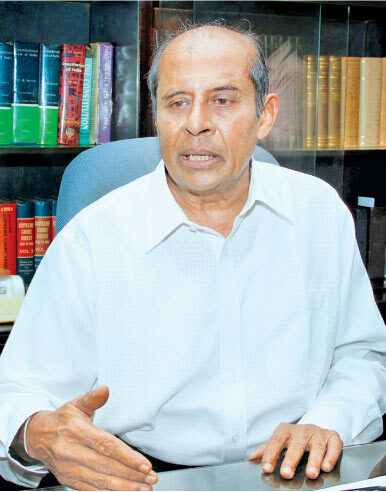 “The resolution which will be presented to UNHRC does not by itself have adverse issues, but we have to be watchful as it is connected with other resolutions which could be harmful,” Samarasinghe told Parliament. Leader of the Opposition Mahinda Rajapaksa meanwhile urged the government not to co-sponsor resolutions in Geneva this year. Issuing a statement, Rajapaksa was critical of the current government’s decision to co-sponsor resolutions at the UNHRC, beginning in October 2015. By co-sponsoring that resolution in 2015, the Sri Lankan government officially accepted the report prepared by the Office of the High Commissioner on Human Rights (OHCHR), which directly accused the Sri Lankan Armed Forces of many crimes including torture, enforced disappearances, deliberate targeting of civilians and the denial of humanitarian assistance to civilians, Rajapaksa alleged. Rajapaksa was also critical of the government’s decision to enact new legislation in keeping with resolutions passed in Geneva, particularly The Office of Missing Persons Act and the Prevention of Enforced Disappearances Act. Former Foreign Minister and present Minister of Finance Mangala Samaraweera has taken it upon himself to respond to Rajapaksa. In a statement, Samaraweera denies Rajapaksa’s claim that the present resolution before the UNHRC in Geneva was ‘against’ Sri Lanka. “As a result of Sri Lanka taking charge of discharging its own responsibilities towards its own citizens, international efforts became focused thereafter on support for Sri Lanka’s efforts. Contrary to Mahinda’s narrative, there are no resolutions against Sri Lanka in the Human Rights Council anymore,” Samaraweera argues. Samaraweera noted that in 2009, the Rajapaksa government spearheaded a resolution in the UNHRC calling it a ‘victory resolution’ and had it adopted by the Council. The Rajapaksa government included in that resolution, the joint Statement between the government and the United Nations that was adopted during United Nations Secretary-General Ban Ki-moon’s visit to Sri Lanka at the end of the Eelam war and also a commitment to implement the 13th Amendment to the Constitution. Non-implementation of this resolution which was adopted by a vote led to a series of resolutions which the Rajapaksa Government claimed to boycott but were nevertheless adopted by the UNHRC year after year, Samaraweera pointed out. The much-disputed resolution now before the UNHRC has four key components. It requests the government of Sri Lanka to implement the measures identified by the Council that are outstanding. It welcomes the positive engagement of the government of Sri Lanka with the OHCHR. It requests the OHCHR to provide advice and assistance on the promotion and protection of human rights, justice, reconciliation and accountability with the concurrence of the Sri Lankan government. Finally, it also requests the OHCHR to assess the implementation of its recommendations. The main sponsors of this resolution are Canada, Germany, Montenegro, North Macedonia, the United Kingdom and Northern Ireland. Sri Lanka, in keeping with the present government’s policy of engagement with the UNHRC, is expected to co-sponsor the resolution. However, Foreign Minister Tilak Marapana clarified that the report of the UNHRC and the resolutions were separate issues and that acceptance of the resolution did not amount to acceptance of all the findings of the UNHRC’s report. The government will dismiss the claim made in the UNHRC report that the military had failed to hand over the lands held by them to the civilians in the North, the Foreign Minister noted. “We will inform the UNHRC that the military had handed over 90 per cent of the lands held by them to their owners,” he said. Despite the initial dispute over who will represent the country and anxiety in diplomatic circles as to whether the President will have his own delegation in addition to another ‘government’ delegation, that matter has been resolved now. As Mahinda Samarasinghe noted in Parliament, there was agreement that such a move could cause irreparable damage to the country’s image and integrity. The delegation now representing Sri Lanka is led by Foreign Minister Tilak Marapana and will include parliamentarian Sarath Amunugama, Northern Province Governor Suren Raghavan, Foreign Secretary Ravinatha Aryasinha and Deputy Solicitor General A. Nerin Pulle. They will be joined in Geneva by Sri Lanka’s Permanent Representative to the United Nations in Geneva, A.L.A. Azeez and Deputy Permanent Representative to the United Nations in Geneva, Samantha Jayasuriya. The report of the OHCHR on ‘Promoting reconciliation, accountability and human rights in Sri Lanka’ will be presented to the ongoing 40th Session of the UNHRC while the draft resolution on Sri Lanka on the same theme, which Sri Lanka has signed up to co-sponsor, is scheduled to be taken up today (Thursday). The hullabaloo generated in Colombo in the lead up to the UNHRC sessions in Geneva indicate that all political parties have an eye on its political implications. While the government is obliged to fulfil its obligations to the international community, the opposition has not hesitated to seize the opportunity to trot out its favourite slogan- that the government has become a cat’s paw of the West and is therefore dancing to the tune of Eelam propagandists. Nevertheless, the resolution regarding Sri Lanka does not impose any major undertakings on Colombo in the short term. With presidential election due this year and general elections due before the next sessions of the UNHRC, the future direction in engaging with the UNHRC will be decided by leaders and governments that will come into office at those elections. Therefore, in a sense, all this is much ado about nothing.